UREA, the major end product of protein catabolism in animals, is primarily produced in the liver and secreted by the kidneys. It is the primary vehicle for removal of toxic ammonia from the body. Urea determination is very useful for medical clinicians to assess kidney function of patients. 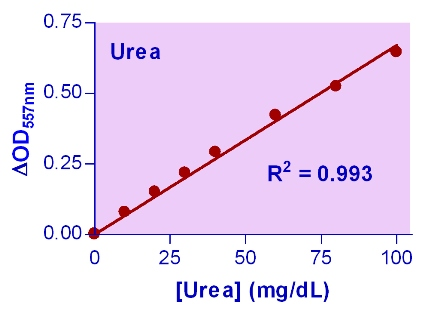 In general, increased urea levels are associated with nephritis, renal ischemia, urinary tract obstruction, and certain extrarenal diseases (e.g. congestive heart failure, liver diseases, and diabetes). Decreased levels often indicate acute hepatic insufficiency, but may also result from over vigorous parenteral fluid therapy. This colorimetric urea (BUN) assay is based on urease catalyzed conversion of urea to ammonium and carbon dioxide. The pH of the reaction medium is monitored by a chromogen and the intensity of the reaction product at 557 nm is directly proportional to the urea concentration in the sample. For quantitative enzymatic determination of urea. Shipped Ambient, Store at Store at 4°C or -20°C., 6 months shelf life.